I love old things and enjoy being around people who are ‘experienced’ in life. I hope Marijke doesn’t mind that I tell everyone she is turning 60 in a couple of months. 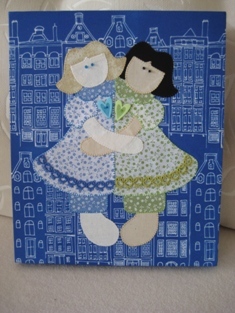 To celebrate my ‘special’ friendship with Marijke, I have made this appliqué and mounted the piece on an old canvas. I was on the plane back from the Australian Machine Quilting Festival (AMQF) in Adelaide a few weeks ago and was flicking through old magazines that came with the bag given to me at the festival (and yes, I will soon become on of the Statler sisters). I found this particular pattern in the Australian HomeSpun No. 82 (Vol11.3) that instantly reminded me of my friendship with Marijke and thought to myself that I must make it. I got the project going straight after I came back. 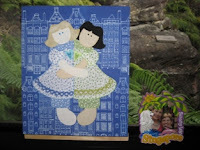 I even forgot about my piano lesson on the day while working on the appliqué (my piano teacher wasn’t impressed). I have made the appliqué ‘mine’ by changing the colours and adding a few things to the pattern including the hearts and my tatted trims on the skirts. I used the Dutch Houses fabric for the background to reflect my love for ‘Dutch’ and the fact that Marijke is a Dutch lady. Linda Robertus designed the fabric and I bought it from Spoonflower. 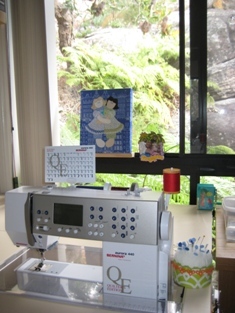 The canvas is now sitting on the window sill in my sewing room, in front of my Bernina where I can see it all the time. And, I smile at the appliqué every time I see it. What a great idea Em, and it turned out very well! Your adaptation of Majella Rush's design looks great. Please get in touch if you'd like it considered for our Readers' Showcase pages. I'm flattered with your complements, Linda and Elizabeth. :-) Thanks very much. Yes, it did come to mind to get in touch with Homespun, Elizabeth. I have been extremely busy with work up until last week, hosting a workshop at work. I will write to Homespun some time today. Thanks very much for your suggestion.